The tragic tale of the ship Lady Luvibund (sometimes written as Lady Lovibund), is one of the great British ghost stories. It is now so wreathed in legend that is hard to separate fact from fiction, but people from all around the world are still intrigued by tales of the ghost ship, as shown by the number who turned up in 1998, hoping to see it! The story begins happily on February 12, 1748, with a wedding in London between Simon Reed, captain of the ship Lady Luvibund, a triple-masted schooner, and his beloved, known to us only by her first name, Annette. The first mate on the ship, John Rivers, served as the best man at the wedding but, unknown to the happy couple, he harboured a secret jealousy of their love – and was tormented by his own desire for Annette. Blissfully unaware of the impending danger, the bride, bridegroom, and a host of their guests set off the next day on a celebratory voyage to Portugal. Simon Reed took the helm for a while but then handed over to one of his men so that he could join his guests in the festivities underway below deck. It is not known whether what happened next had been planned by Rivers in advance or was an act of spontaneous folly. In either case, he had clearly been driven mad by his jealousy. He violently subdued the helmsman, took control of the steering wheel, and began steering it towards the nearby Goodwin Sands, a notoriously dangerous spot, close to the town of Deal, which had served as the graveyard for many a fine ship. The guests were still ensconced in the partying below and had no inkling of the peril they were in. Tragically, all perished in the ensuing wreck. But the story doesn’t end there. Fifty years later, on February 13, 1798, the captain of the coastal vessel, Edenbridge, reported almost colliding with a triple-masted sailing ship, and hearing the sounds of merriment coming from it as it passed by. Local fishermen reported that they had seen the ship too. In 1848 and 1898, also on February 13th, a similar thing happened. Locals spotted what they thought was a three-masted sailing vessel plunging to its doom against the shore. On rushing to give their assistance, they found that it had disappeared. It is not clear whether the ship was spotted at all in 1948. Some say that people were too pre-occupied with post-war hardships to pay much attention. 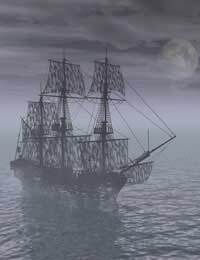 In 1998, however, a large number of people from countries all over the world gathered in hope of seeing the ghost ship. Fishermen plied the local waters, their boats full of tourists rather than fish, all eager to catch a glimpse of the vessel. Alas, they were all to be disappointed. The ship didn’t appear. Have the ship and its passengers found their peace at last? Will it ever be seen again? Most likely, in 2048, there will be at least a small contingent waiting on the shoreline, hoping to catch a glimpse of the mystery vessel. I'm into paranormal things. I've been doing research about unexplained and mysterious happenings from the past and the present. I'd like to see this ghost ship but it's like 26 years from now and my place is very far from it. My family and I lived in a property called 'Gladstone villa'in the former mining town of Bargoed in the Caerphilly county borough of the South Wales valleys.We experienced things that defied rational explanation. .e would hear things like footsteps in the main bedroom when we would all be down stairs watching Television and one of us would turn the sound down to hear it more clearly.There was also the occasional sighting. One day my mother saw the ghost of an old man by the doorway.We had the ghost for so long my grandmother called him 'Johnny the ghost'.